This Roasted Pepper Turkey Sandwich is made with turkey, lots of cheese, sweet red peppers and crunchy ciabatta bread. Making sandwiches in the air fryer is going to become your new FAVORITE thing! When I’m asked what my favorite food is I instantly say, ‘Sandwiches.’ I definitely live by my personal heroine’s wisdom on what makes the sandwich so great. So many combinations of flavors from the meat and bread, to what vegetables and types of cheese to add and what sauce to slather on it. My favorite though has to be one that is warm and has a nice and crunchy bread. So guess what I do to get that nice and toasty bread? 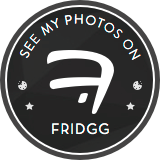 Tip: I use my air fryer to make sandwiches! What movie pairs well with a turkey sandwich and craft beer pairing? For tonight’s Mitten Movie Night we are watching Bohemian Rhapsody. I know I’m a little late to the party but honestly I was having a hard time wrapping my head around Sacha Baron Cohen NOT being in it. Did you know he was originally slated to play the lead? What beer pairs well with a Roasted Pepper Turkey Sandwich? Blonde’s are by far my favorite beer. Slight citrus and the sweetness of honey this is a beer that pairs well with pretty much any sandwich craving I’m having. Butter one side of two slices of ciabatta bread. Lay one piece butter side down in the bottom of the air fryer basket. To the bread add half the cheese, half the red peppers. Layer the turkey on top. Repeat the cheese, red peppers and the final piece of bread with the butter side up. To the top of the bread sprinkle with garlic powder and Parmesan cheese. Place the basket back into the air fryer and set at 350 degrees for 5 minutes. After 5 minutes in the air fryer. Open the drawer and flip the sandwich. Cook an additional 2-3 minutes. This Roasted Pepper Turkey Sandwich is so easy and delicious! Turkey, red peppers, lots of cheese and a crunchy bread made right in the air fryer. Cut the sandwich in half and serve. Enjoy! Looking to have a cozy Friday night in? And how would you like to make up a chicken dinner that can be made all in one pan and bake while you lounge on the couch reading or watching movies? Am I speaking your language yet? 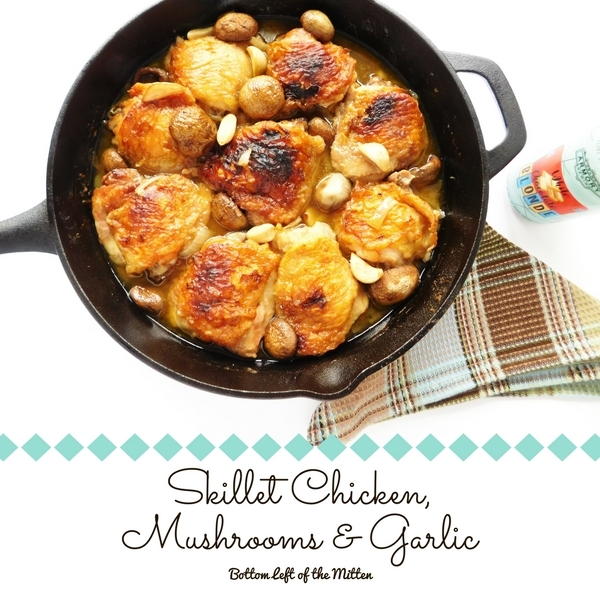 This skillet chicken, mushrooms & garlic is the perfect dinner for a great night in. So tonight for Mitten Movie Night I made one of my favorites, a simple chicken dinner. I love nothing more than chicken with a light gravy and mashed potatoes. This meal paired so well with the White Chocolate Blonde from Grand Armory Brewing that we picked up when we were out hunting for Hopslam. With only a hint of chocolate, it went great with the meaty mushrooms, tender chicken, and light sauce perfectly. Recommended to watch: The Secret of Marrowbone. This movie had me thinking about it long after it was over. A little bit of horror with a surprise twist at the end. 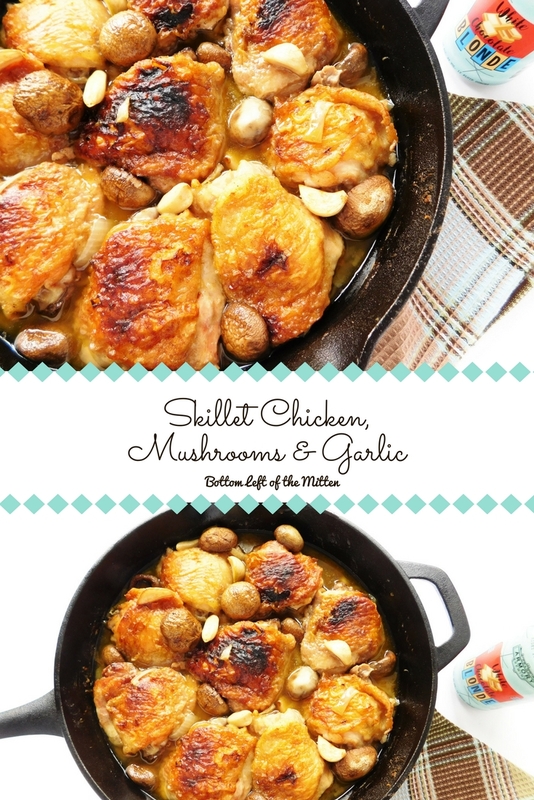 So cuddle up because the weather is still cold and let’s get to the recipe for skillet chicken, mushrooms & garlic. Do you have a cast iron skillet? 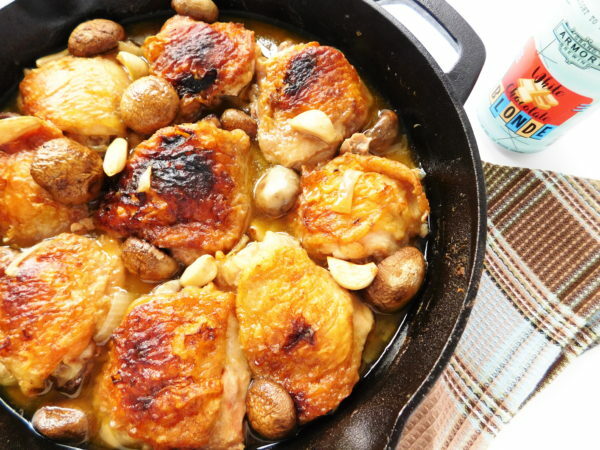 If not this skillet chicken dish works well in a dutch oven too. I’ve been using my cast iron like crazy since I got it this summer. Before having one I always thought that it would be too intimidating but I was simply wrong about it. Easy to clean and you can make everything from burgers to dessert in it. Start off by preheating the oven to 350 degrees. On the stove heat the pan and add the 1/4 cup olive oil. On a plate add the flour, salt, pepper, and thyme. Combine the spices and flour together then dredge each chicken piece into it then add them skin side down to the pan. Cook for 5 minutes, flip over and cook another 5 minutes on the other side. While the chicken is cooking chop the onion, clean the mushrooms and get the garlic peeled. Once the chicken is cooked remove and put on a separate plate. The chicken does not have to be cooked you just wanted to crisp up the skin. To the same pan add 1 Tbs of butter. With a spatula bring up the little bits on the bottom of the pan and add the onions. Brown them until translucent for 2-3 minutes. By now the kitchen should be smelling amazing! Now that the onions are cooked add the liquids: wine and chicken stock. Add the chicken back to the pan. Then finally add the mushrooms and garlic on top of that. Turn off the heat to the skillet on the stove top then put the whole pan into the oven. Cook the chicken for 60 minutes but to keep it moist every 15 minutes take a spoon and pour the juices from the pan over the chicken. While it’s cooking make up some mashed potatoes and a vegetable side. Plate it up and here you are….. 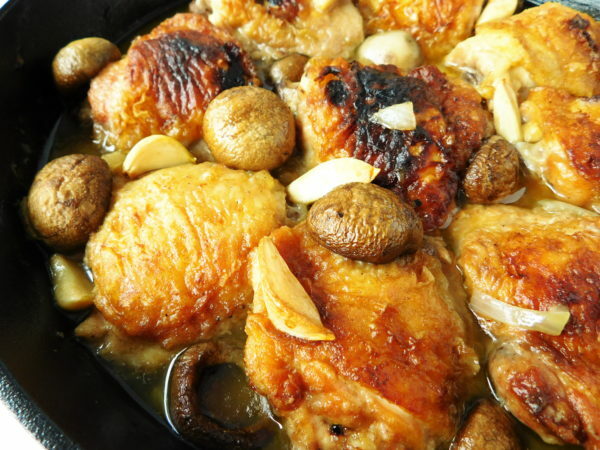 Break out the cast iron skillet and enjoy this Skillet Chicken, Mushrooms & Garlic. This one-pan meal that is perfect for a great night in. Start off by preheating the oven to 350 degrees. On the stove heat the pan and add the 1/4 cup olive oil. On a plate add the flour, salt, pepper and thyme. Combine the spices and flour together then dredge each chicken piece into it then add them skin side down to the pan. Cook for 5 minutes, flip over and cook another 5 minutes on the other side. While the chicken is cooking chop the onion, clean the mushrooms and get the garlic peeled. Once the chicken is cooked remove and put on a separate plate. The chicken does not have to be cooked you just wanted to crisp up the skin. To the same pan add 1 Tbs of butter. With a spatula bring up the little bits on the bottom of the pan and add the onions. Brown them until translucent for 2-3 minutes. Cook the chicken for 60 minutes but to keep it moist every 15 minutes take a spoon and pour the juices from the pan over the chicken. Plate it up. Enjoy! A sweet chicken and corn filling is rolled up in and fried to crispy perfection. Street Corn Taquitos make a great appetizer or dinner! Has this Summer been busy! I have been doing so much around the house, we’ve been running around and I haven’t had much time to work on this little blog. Even sadder is it’s been weeks since I’ve celebrated Mitten Movie Night which is probably my favorite of all posts to do on the blog. So let’s rectify that right now and enjoy some Michigan craft beer and these Street Corn Taquitos. What beer pairs well with Street Corn Taquitos? Tonight I am pairing this dish with one of my favorite types of beer, a blonde. This pairs perfectly with the crispy tortillas, the bursts of sweet corn in the filling and the creaminess of the mayo. What movie pairs well with street corn themed appetizers? In anticipation of the upcoming Eclipse I want to watch a classic from the 80’s that always freaked me out, Night of the Comet. I know it’s not an eclipse but it is space related phenomena so close enough. Where are you planning on watching the eclipse? The boys and I are going to our local library where they are having a watching party. How exciting! For the chicken, I cooked mine in the crock pot with some salt & pepper. How to make shredded chicken? To shred it I wanted to try something that I saw on Pinterest and guess what, it WORKED! Use a KitchenAid mixer to shred the chicken. I cut the chicken in half, put it into the mixing bowl and turned it on high. Less than 3 minutes later beautifully shredded chicken without the work. Genius! To the same bowl add the rest of the ingredients for the filling: mayo, cream cheese, sour cream, lime juice, corn, cilantro, cheese, and spices. Stir to combine. Add enough oil to the bottom of the pan that it will fry these up around 1/2 cup. While the oil heats upstart assembling the taquitos. Place the filling along the longest end, not too much that it spills out. Roll it up. Once the oil is heated up place the tortilla in seam side down. Fry for 2 minutes, then flip. Fry for another 2 minutes then place on a plate lined with paper towels to drain. Work the taquitos in batches of 2-3 depending on the size of your frying pan. Don’t overcrowd or they won’t fry properly. Serve with sour cream, chopped tomatoes, and lettuce. Sweet corn, shredded chicken and a creamy filling wrapped in a corn tortilla then fried to a crispy golden brown. Street Corn Taquitos make the perfect appetizer or even a main dish. To a bowl with the chicken in it add the rest of the ingredients for the filling: mayo, cream cheese, sour cream, lime juice, corn, cilantro, cheese and spices. Stir to combine. Add enough oil to the bottom of the pan that it will fry these up around 1/2 cup. While the oil heats up start assembling the taquitos. Place the filling along the longest end, not too much that it spills out. Roll the it up. Once the oil is heated up place the tortilla in seam side down. Fry for 2 minutes, then flip. Fry for another 2 minutes then place on a plate lined with paper towels to drain. Work the taquitos in batches of 2-3 depending on the size of your frying pan. Serve with sour cream, chopped tomatoes and lettuce. Enjoy! 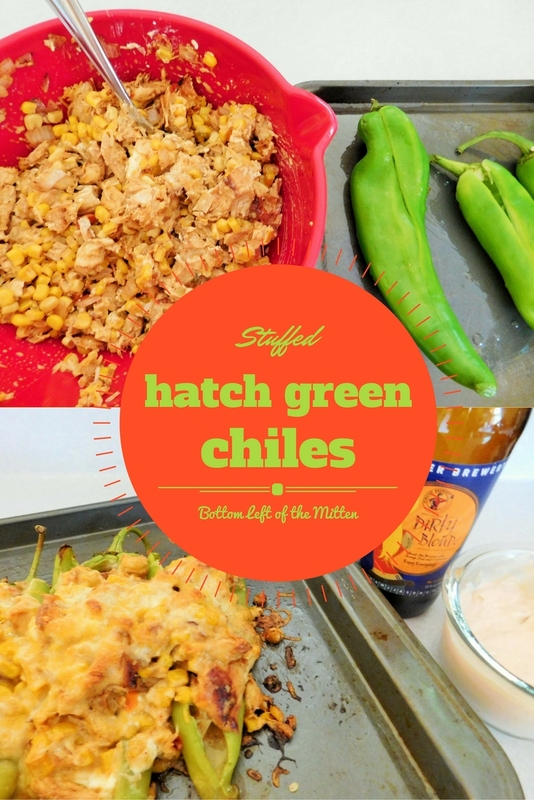 When Hatch Chile season comes around, make sure you have this Stuffed Hatch Green Chiles recipe on hand. Loaded with cream cheese and chicken stuffing then baked to perfection. Tonight for Mitten Movie Night I decided to experiment with an ingredient that I’ve been seeing in the stores a lot lately, hatch green chiles. This isn’t a food that I would normally cook with, actually never had one before, I knew that my husband enjoys jalapeno poppers so the recipe started taking shape in my head. Since these are large I figured they would be perfect for stuffing and I was right. 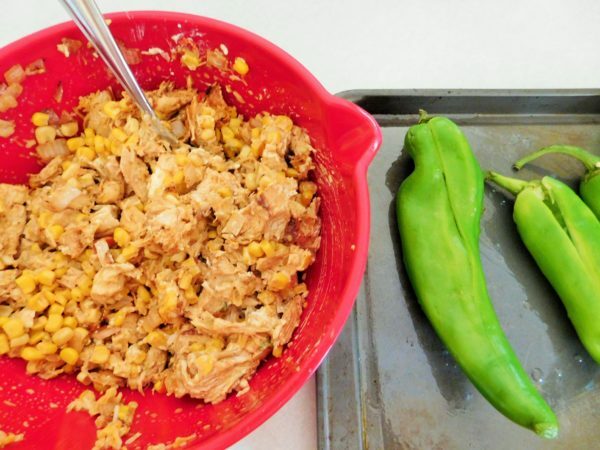 You will really enjoy the mellow flavor of the chile letting the chicken and corn in the stuffing come through. 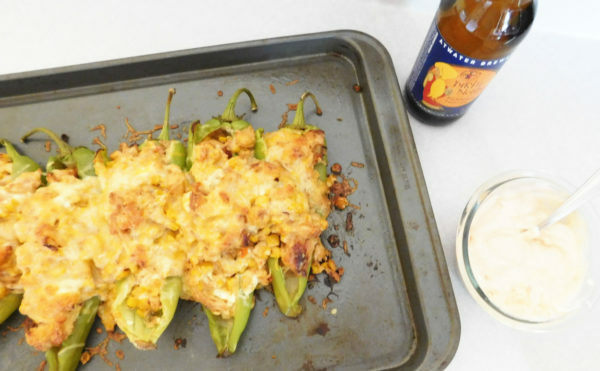 What beer pairs well with Stuffed Hatch Green Chiles? The beer: Dirty Blonde from Atwater Brewery. What should you watch while enjoying a beer and hatch chiles stuffed with cream cheese and chicken? We’re watching Shameless the start of Season 6. They actually started putting the series on Netflix instant so if you haven’t watched it yet I HIGHLY recommend it. William H. Macy was born to play this roll in my opinion. This ended up being a very simple meal. Cut your onion and saute in a pan to brown. Set aside and just use the same pan to cook your chicken. Heat oil in the pan then add chicken to it. It is very important to cook the chicken at least 8-10 minutes without turning. This puts the ‘blackened’ portion into the recipe. Once it is cooked flip and cook other side an additional 8-10 minutes. 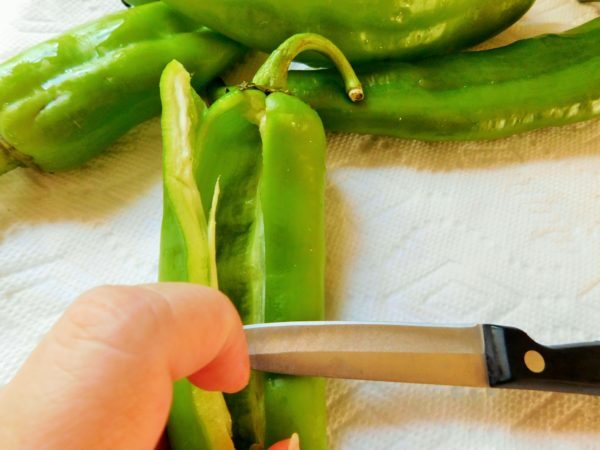 Leaving the stem on just cut horizontally down to the tip of the chile. With the split open remove the core and what seeds you can. Over the sink rinse out the inside of the chile removing the remaining seeds. Onto a greased baking sheet place the cleaned peppers. Once the chicken is cooked shred and cut up in smaller pieces. Add to your cream cheese, half of the shredded cheese, sauteed onion, spices and you’re drained can of corn. Once the mix is all combined stuff your Chiles with it. I had 6 peppers but this amount of stuffing could have been spread over 8 but I only had 6 and they turned out great overstuffed. On top of that add the rest of the cheese. Bake at 350 degrees for 30 minutes. Done! Served with sour cream that had a small amount of Chipotle pepper in it. Maybe add a side of double batch smashed beans. Originally published in September of 2016. Updated information in April of 2019. 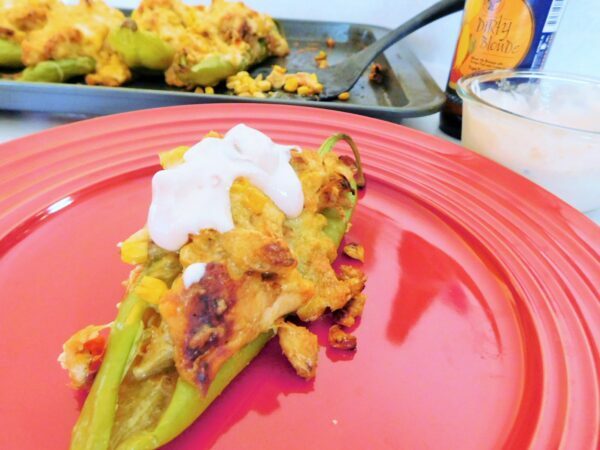 These Stuffed Hatch Green Chiles are loaded with cream cheese and chicken stuffing then baked to perfection. 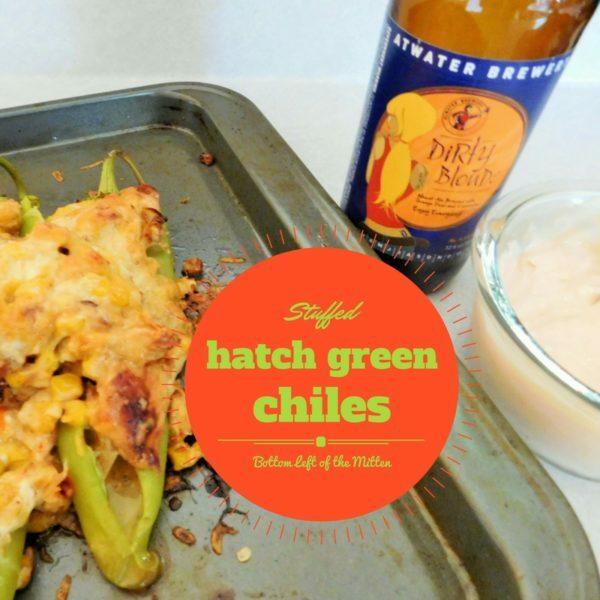 A great recipe for hatch chile season. 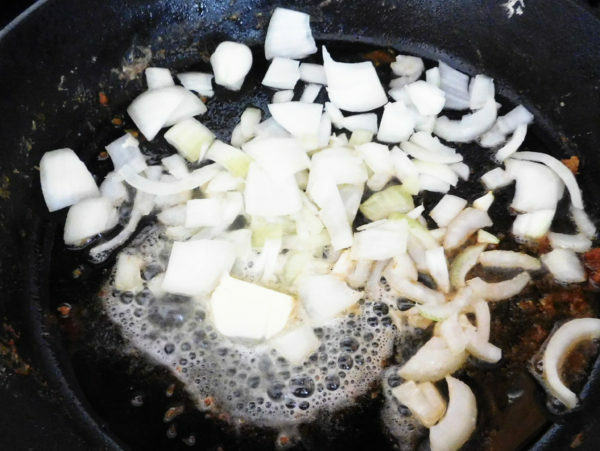 Cut your onion and saute in a pan to brown. Set aside and just use same pan to cook your chicken. If cooking your own chicken. Cover both sides of chicken generously with Cajun seasoning. Heat oil in the pan then add chicken to it. It is very important to cook the chicken at least 8-10 minutes without turning. This puts the ‘blackened’ portion into the recipe. Once it is cooked flip and cook other side an additional 8-10 minutes. Leaving the stem on just cut horizontally down to the tip of the Chile. With the split open remove the core and what seeds you can. Over the sink rinse out the inside of the Chile removing the remaining seeds. Place onto a greased baking sheet. Once your chicken is cooked shred and cut up in smaller pieces. Add to your cream cheese, half of the shredded cheese, sauteed onion, spices and your drained can of corn. Once the mix is all combined stuff your Chiles with it. On top of that add the rest of the cheese.